This is a recipe I made for my husband's coworkers to share on Christmas Eve. 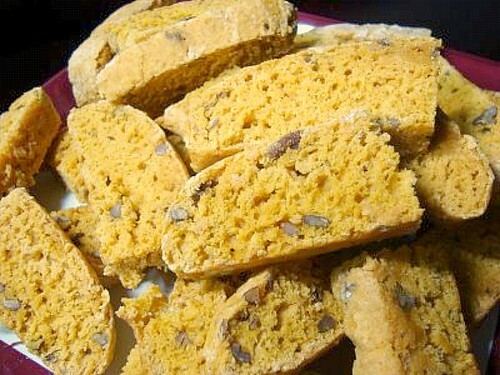 This biscotti has a rich pumpkin color and the flavor really shines through. 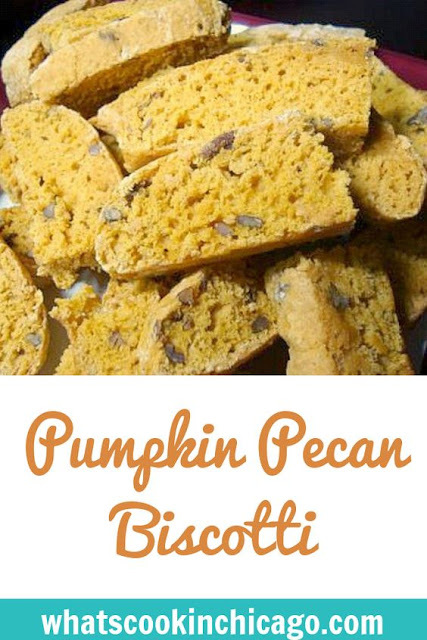 It's not too sweet and the pecans really add a nice crunch! - Lightly grease your cookie sheet. - Sift flour and baking powder into a bowl. Add white sugar and salt and stir together. - In another bowl combine all the wet ingredients: pumpkin, vanilla, egg and brown sugar. - Pour dry ingredients into wet ones along with pecans; stir together. - Flour a board and turn dough out onto it. Form 1 large log. - Put onto cookie sheet and pat down to 1/2 inch thickness. - Bake at 350°F for 20-23 minutes. Turn oven down to 300°F. - Remove logs from cookie sheet and cool for 10 minutes. - Then cut into about 1/2 inch slices and bake 15 minutes at 300°F. *Biscotti will still be soft but will harden as they cool. You have a precious blog!!! I'm making the Pumpkin Biscotti recipe but it does not say how long to bake after reducing the heat to 300 degrees? Can you please post this, it's in the oven now :)! Nanni - sorry to respond so late (I've been at work all day!). When you turn down the heat to 300, remove the logs & cool 10 minutes... then pop back in the oven to bake for 15 minutes (as noted in the recipe above.) Apologies if it was written in a confusing way and hope they turned out well!